Mean Creek has it all! A fake Macaulay, a fake Andy Milonakis, a fake dude from Parker Lewis, a fake Arquette daughter, a fake Breckin Meyer, a fake cameo from a fake Jump to Conclusions guy, and a fake Wayne Knight as gay other dad. The soundtrack even boasts a fake Elliott Smith, a fake Silver Mt Zion, and a fake Superchunk. Hey, what did you expect? It's just a fake Bully. A less disturbing and less -- ahem -- "adult" Bully, but a fake one nonetheless. 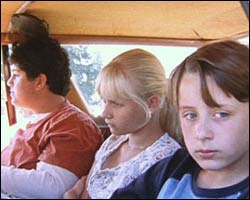 That said, we thought this Culkin kid really killed it. If it didn't already have a Rory adorning its metaphorically hallowed hall(s), the Highland Cinema would accept Culkin Jr's application for admission. Sorry, kid. Keep up the good work and someday you could find yourself heralded right alongside him! And speaking of killing it, this guy spent the entire movie copping Tyler Durden. "Stop!" we said. "Pots! " Where's a chemical burn when you need one? I really wanted to like this movie since we don't get a lot a "real" films at the cinema. Kinda wanted the fat kid to die. This was the sad "Goonies."